A Philippines-based nongovernmental organization is calling on Manila ‒ as well as Filipino citizens ‒ to take immediate action to reduce and restructure plastic use after a young whale washed ashore and died as a result of what it described as an unprecedented amount of plastic waste in its stomach. Local officials and fishermen attempted to release the whale upon discovering it, but the Bureau of Fisheries and Aquatic Resources says the weak mammal ultimately returned to shallow water. Upon collecting the creature from the beach, Davao's D'Bone Collector Museum carried out a necropsy that revealed the 4.7-meter-long juvenile whale had ingested about 40 kilograms of plastic within its short life. "It's very disgusting and heartbreaking," Museum Director Darrell Blatchley told AFP. "We've done necropsies on 61 dolphins and whales in the last 10 years, and this is one of the biggest [amounts of plastic waste] we've seen." 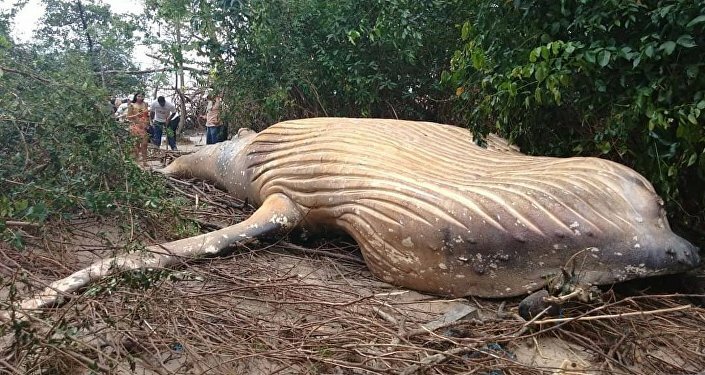 Regional bureau director Fatma Idris told the outlet the whale, unable to swim on its own due to emaciation and depleted energy, struggled and vomited blood during its final hours. The whale's death comes shortly after a March 7 Global Alliance for Incinerator Alternatives (GAIA) report found Filipinos "use more than 163 million plastic sachet packets, 48 million shopping bags and 45 million thin film bags daily." With no national policies geared toward decreasing this plastic footprint, GAIA and other environmental organizations are "calling on governments and manufacturers to regulate, and stop producing, single-use plastics," as it's estimated 10 companies are responsible for 60 percent of all branded waste collected on the island. Plastic pollution is not limited to the Philippines, however, as many other southeast Asian nations are experiencing the same issue. About five months ago, Sputnik reported on a sperm whale that had washed ashore in Indonesia with over a thousand bits of plastic garbage in its stomach. Another whale was beached in Thailand last summer, and at least 80 pieces of plastic were retrieved from its insides, according to The Independent.